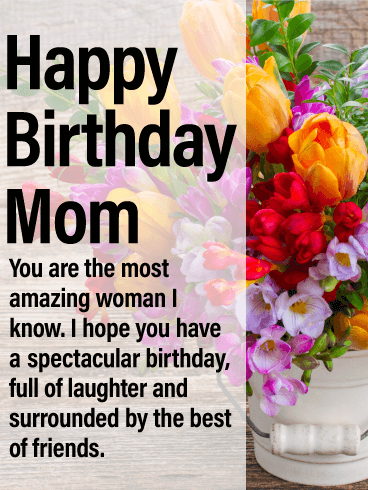 This amazing greeting card will give your mother the gift of joy for her birthday! It showcases a magnificent cake surrounded by star confetti and a message that any mother would just love to read on her special day! 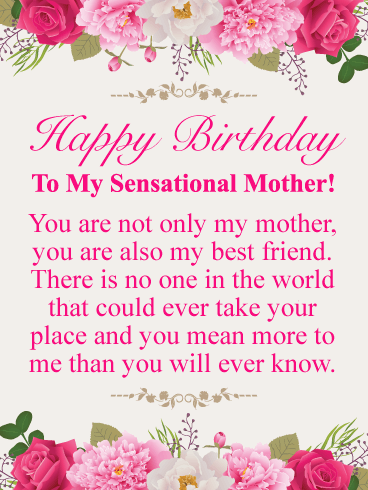 This birthday card expresses that a mother's love is forever and that you hope her day is as special as she is! Get this terrific birthday cake over to your mother so she can enjoy it on her big day! 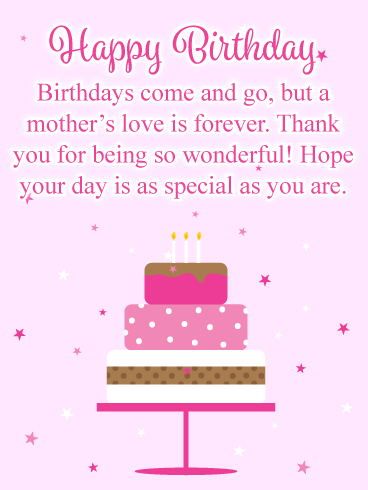 Happy Birthday - Birthdays come and go, but a mother's love is forever. Thank you for being so wonderful! Hope your day is as special as you are. 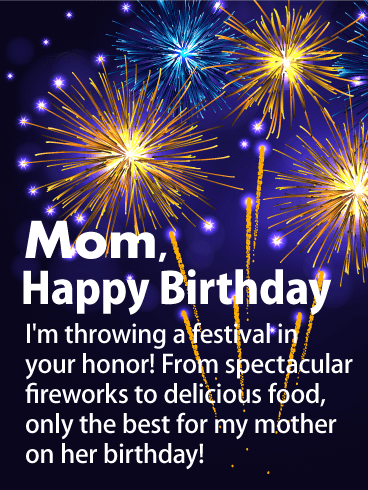 Make your mother's birthday fabulous and send her a fireworks show just for her! Bright gold and blue fireworks burst apart to deliver more than lights in the night sky. They shower your mother in wishing dust, turning an ordinary birthday into a spectacular one. 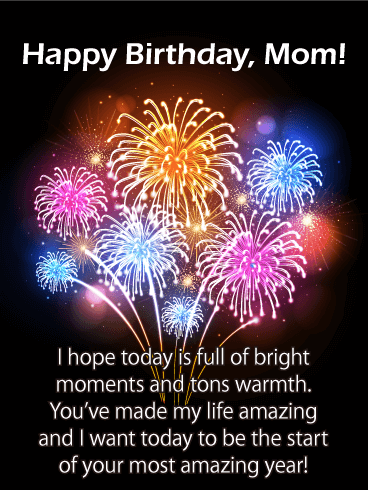 Make your mother's birthday fabulous and send her a fireworks show just for her. 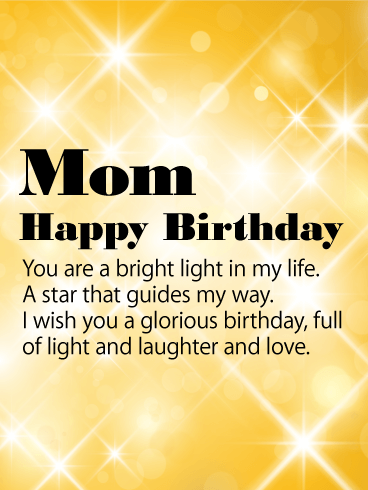 Light up your mother's birthday with this festive birthday card! Mothers are our first teachers and the lessons they share are more important than geography or English lit. Instead they part life lessons, and we use them to guide our actions and days for our entire lives. 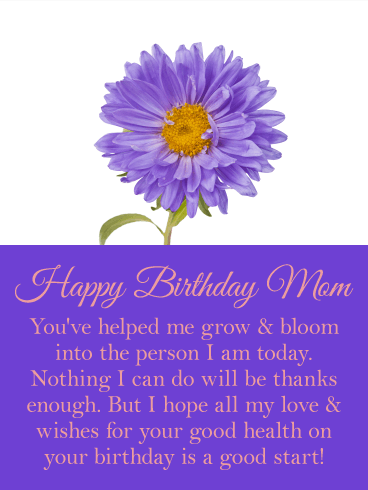 Show your mother how much you've absorbed her teachings by wishing her an amazing birthday. Shower her with love and well-wishes, giving her the gift of a perfect birthday. Boom! Crash! Happy Birthday! 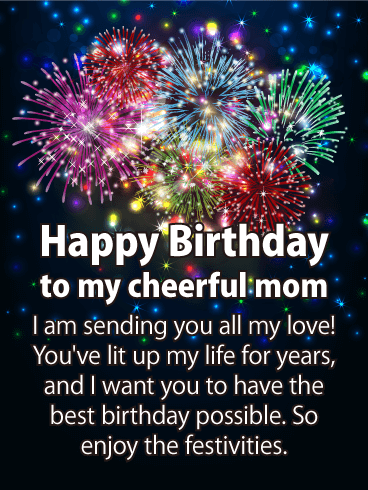 It's hard to tell what will surprise your mother more - the brilliant fireworks on this card or the power of your birthday wishes! 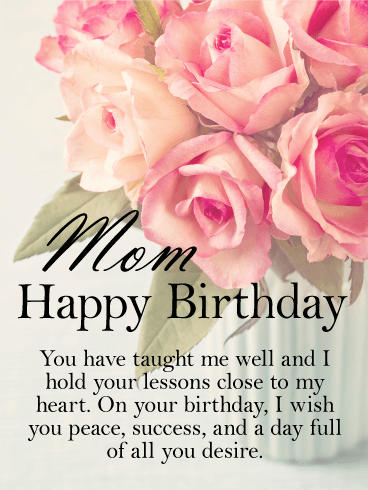 For all that your mother has done for you, no other person deserves a better birthday. 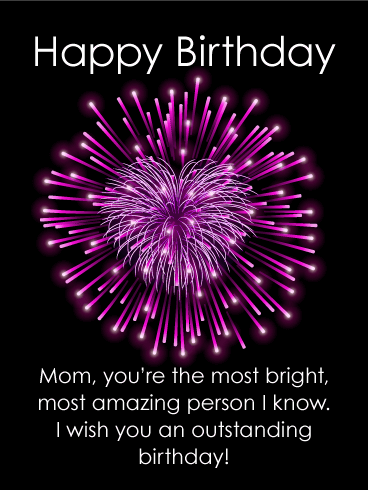 So light up her night with this bright card and let your mother know how special she is on her birthday. She deserves a parade just for her. This delightful fancy cupcake birthday card will add joy to your mother's big day! It features a lovely image of specially decorated birthday cupcakes topped with frosting flowers and bows! The pastel colors look fabulous with the bright pink background! The meaningful message expresses that you are thankful to have such a loving mother, and that you appreciate all that she has done for you. 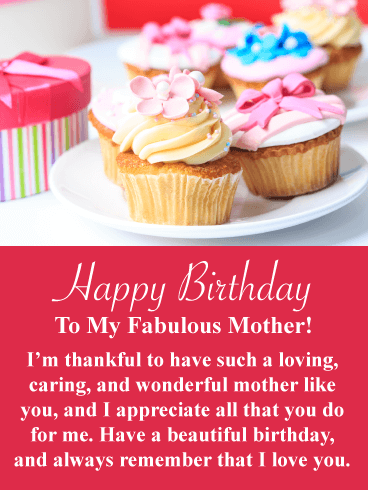 So wish your mom a beautiful birthday with this charming cupcake birthday card, she will love it! Mothers form our foundations. They make us who we are - through advice, time, and love. Everything we are is thanks to them. On your mother's birthday, build the pillars she needs for a stupendous year. Wish her laughter. Wish her success. Wish her love and health. Let her know that just as she has built you up over the years, you will build up your mother. And you're aiming to lift her higher every year on her birthday. Your mother has always treated you well. From gifting you the earrings you eye in the store to making your favorite meal when you visit, she goes out of her way to make you happy. For your mother's birthday, go above and beyond with thanks to this card. Let her know how much you appreciate everything she's done for you and show her now it's your turn to spoil her rotten for her birthday. We are all undeniably unique blooms - from our petals soft and gentle, our vibrant colors, to our quest for sun. But we would be nowhere without the gardener, the mother, who nurtured us from seed to blossom. Nourish your mother on her birthday. Wish her sunshine-love and laughter-rain, pest controlling-hugs and fond memory-fertilizer. Your mother helped you grow. Return the favor on her birthday and plan to celebrate many more years together. Impress your mother this year by sending an exquisite birthday card for her big day. She will be filled with happiness when she sees the beautiful flowers and kind words that her loving child has written just for her. The best part is that she will read that you consider her your best friend, it will certainly touch her heart. Be sure to send these elegant flowers to your mother today so she can see them on her special day. Your mother has listened to your wishes for years in an attempt to grant them. Now it's your turn! 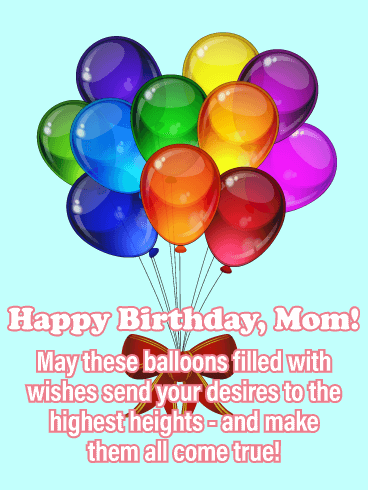 Encourage your mother to wish for many things on her birthday, because with the help of this birthday care you can make them happen! After all, we fulfill wishes to make people happy. And sending your mother this card will overfill her with joy. From there, her birthday can only get better!